Trees don't die suddenly from natural causes, unless the causes are fires or storms. However, trees can show symptoms of decline suddenly after long periods of predisposition followed by infections. 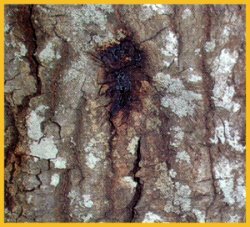 Oozing brown sap is a symptom of the disease. Friends have sent me reports about "sudden oak decline" in California. Calls have also come in. Friends have asked for my opinion. I have not seen the trees. I have seen no data, or dissection and autopsy reports. If the decline is sudden, the growth increments should show this. Regardless, as requested, here are some of my thoughts. I start with the premise that the decline is not sudden. Next, because a species of phytophthora, which is ubiquitous in those soils, has been isolated, I believe that some predisposing factors had to affect the boundary walls of suberin that should form before non-woody roots, especially mycorrhizae, shed. My first thought is a problem due to waterlogged clay soils. I know the areas with decline have clay soils, with some areas having thick layers of heavy clays. I have dug roots in those soils and have examined soil pits. I have dissected many trees in that area, including live oaks and their close relatives. I do have some "inside" information on the soils and the trees. area for the past few years. He faxed me long lists that went back to 1919! I found what I was looking for from weather data from Berkeley and North Coast Drainage areas. From December 1996 through January 1997, the area received 19 inches of rain. Two months! From November 1997 through February 1998, the area received 36.71 inches of rain! Nothing going back to 1919 even came close to that amount for those time periods. The time periods of the two heavy rains fit exactly the periods when non-woody roots and mycorrhizae should be shedding and new ones forming. I know some people say they saw the decline in 1994 and 1995. The heaviest rain year in that area was in 1983 with 48.42 inches. But most of the rain fell in March. Records are not complete for 1991 and 1992. In January 1995, 10.37 inches of rain fell. Because there are so many microclimates in the area, and because heavy watering of lawns is common, it is possible that waterlogging at critical times could have occurred. This could explain the earlier reports. I may be all wrong, but I believe if researchers check the weather periods I checked they will also see the amounts of rain that fell during these critical periods. The heavy rains at those times were a "freak" of nature. The trees are paying the price! Here is a summary of my thoughts: Heavy rains at critical times caused waterlogging in clay soils; suberin boundaries did not form as non-woody roots shed or died; many infection courts; low amounts of air in soils; infection by species of phytophthora; decrease of root energy reserves; buildup of pathogen populations; root defense decreases further; invasion spreads rapidly; top decline becomes obvious; trees begin to die. The article was published in Volume XII, Number 4-April 2001 of TCI.